Welcome to Down On The Street, where we admire old vehicles found parked on the streets of the Island That Rust Forgot: Alameda, California. 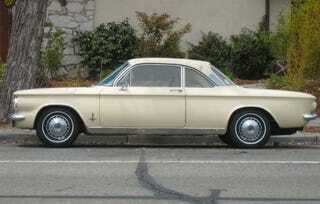 Hooray, another Alameda Corvair! We saw this Greenbrier a couple months back, and this '64 Monza earlier in the year. Prior to that, we'd seen only this Corvair painter's van in the series, making 2009 The Year Of The DOTS Corvair! I shot this car quite close to the spot in which the '71 Plymouth Valiant once lived, and just down the block from this '62 Chevy Nova. As far as I can tell, it's a '64… but I could be wrong. Corvair experts?